When my friend, Becky, showed me this adorable card she made for her son's birthday, I knew right away that I would have to share it on my blog! The timing is perfect as well, as here in Wisconsin, the fishing season opens the first Saturday in May. Becky got really clever and used the inside of zero (cut in half) from the Large Numbers Framelits to make the bobbers! (Great, now I'm totally going to have to get those Framelits). And I especially love the real fishing tackle in the "pockets"! What do you think? 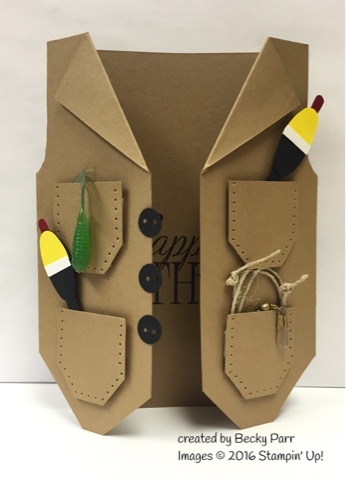 Do you know some fishermen (or women) who would love to get this card?